Throughout the years on this blog, I have pretty much demonstrated a Taliban-like commitment to eating Thai food the way Thai people eat it. It seemed like a no-brainer to me because a fork and spoon are so obviously the best eating utensils ever created. Why on earth would you struggle with a fork or, god forbid, a pair of chopsticks, when presented with a curry and a plate of jasmine rice? Because, no duh, the best way to eat something is the way locals have been doing it for years, and that this was obviously a rule that would apply to every cuisine, no matter what. 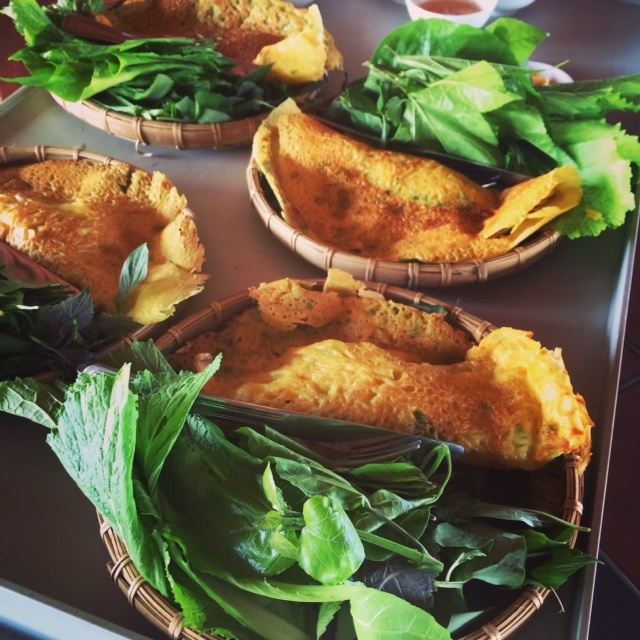 Then I went to Vietnam, and discovered that I have been eating the Vietnamese fried crepe — banh xeo, supposedly named after the sound the batter makes when dropped into a sizzling pan — wrong for years. It turns out the brittle, shell-like crepe is not the vehicle for the herbs: it’s the herbs that are meant to enclose the crepe, the leaves rolled up like an egg roll and dotted inside with bits of crepe crunch like croutons before they are dipped in a sweet-tart sauce and brought to the mouth. Somehow, in all my years of patronizing Vietnamese restaurants all over the globe, no one thought to tell me that Vietnamese people eat their crepes differently than I was eating my crepe. They would just set the plate on my table and walk away, possibly resisting the urge to tell me, just like I resist/don’t resist the urge to tell other people, “You are doing it all wrong”. They simply seemed happy that I was there. This is because Vietnamese waiters are better people than me. I was resolved to learn from my mistakes and to eat things properly from then on. But what happens when you don’t want to do it, even when presented with incontrovertible evidence that you’re DOIN IT ALL RONG? 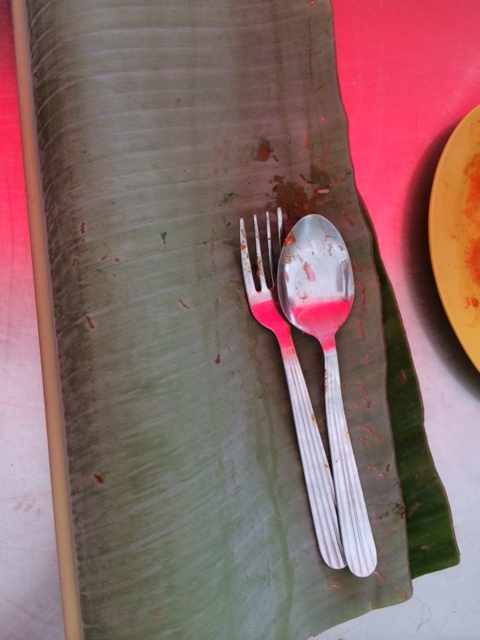 When our friend May took us to a banana curry leaf place called Raja Restaurant on a recent trip to Kuala Lumpur, I was forced to face this very question. In conclusion, I have to say thank everything worth thanking that the folks at Raja Restaurant are not judgmental asses like yours truly and happy to give a fork and spoon to anyone who finds themselves manually challenged. That’s pretty great of them. Because their food is really wonderful, and it would be a shame to miss out on that incredible curry due to my dumb neuroses. As for eating Thai food like Thai people … well, who am I to say how people eat? It’s nobody’s business but yours. I wonder if all the great Thai Kings of the past, who deliberately too the name of Lord Rama, and Bhumibol, were eating with fork and spoon, say 400 years ago? 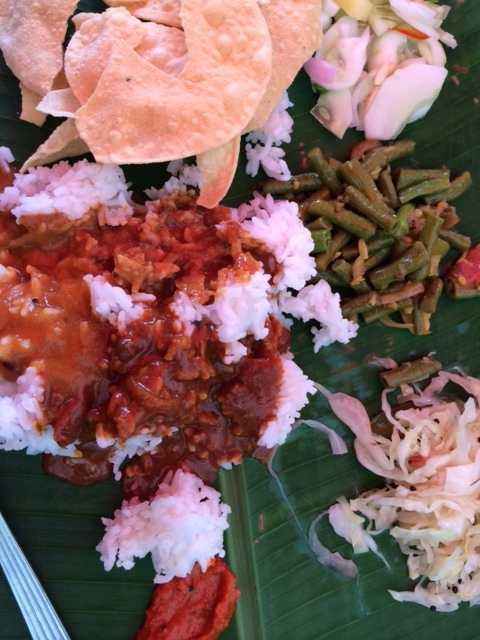 How do 90% of Thais eat at home in the villages? Fork and spoon? How did the Lord Gautama Shakyamuni eat? Undoubtedly, with fork and spoon, thanks to the civilizing influences of some worthy British missionary, who must have taught him the benefits of toilet paper and of not taking regular baths! The Jain monks do not bathe and nor do they clean their teeth, you know, testifying to their indubitable contact with European enlightened thought! God bless your enlightened soul, BG!! You are safe from our primitive spere of influence, finally!! Do you know what HU SHIH, that grand intellectual and perhaps the first Head of State of Taiwan wrote? “Finally, we have been rid of 2500 years of cultural imperialism by India.” By Gosh, who knew? You can verify this quote, with their embassy, if one exists. So yes, you have thrown off the yoke of India, yet once more, showing the world you are DOI, not Shyama, by Golly!! No washing the mouth after eating, just spoon and fork, brilliant, and only toilet paper! And the Buddha? An asinine confused man, sexually confused, needing a good dose of soft-shell crabs [in all senses of that word] plus Kobe beef [again sensu lato]. That is called real Enlightenment, no? Jai America, Jai England, long may they rule Doiland! Thanks for still reading, Gautam. you have agreat sense of humor too. Thais can be so subtly xenophobes it’s amazing.